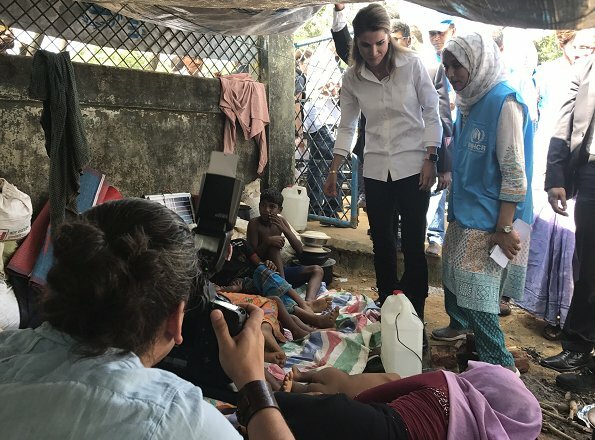 On October 23, 2017, Queen Rania of Jordan visited Rohingya refugees at the Kutupalong Refugee Camp in Cox's Bazar, Ukhia, Bangladesh. According to According to United Nations High Commissioner for Refugees (UNHCR), Since Aug 25, 500,000 have fled to Bangladesh; 200,000 more may arrive in Bangladesh in the coming weeks as the conflict continues. 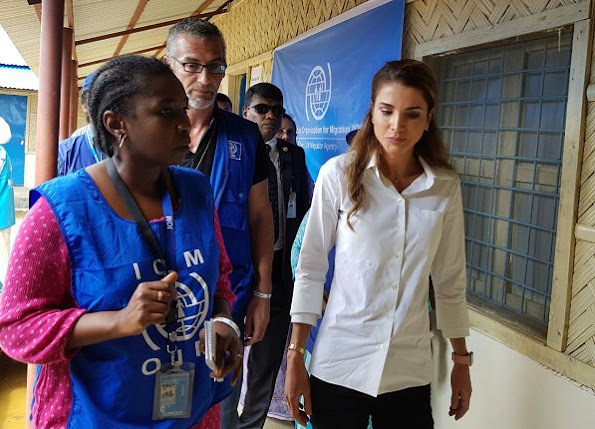 The Queen, is a board member of the International Rescue Committee (IRC) and as an advocate of the work of UN humanitarian agencies. Heel ongewoon om de prinses met zulke zware schoenen te zien. Zal wel praktisch zijn maar het ziet er iets te stoeruit. Rania is an amazing woman who goes to great lengths to publicise appalling social conditions. What a great example for us all.